Altierus Career College’s Norcross campus offers a variety of activities and events to give you the complete student experience. Library hours: Mon. — Fri.. from 7 a.m. to 8 p.m., and Sat. 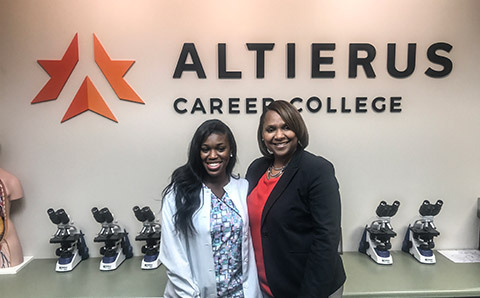 from 9 a.m. to 1 p.m.
Altierus Career College Norcross is accredited by the Accrediting Commission of Career Schools and Colleges (ACCSC). For further information on ACCSC, mail to 2101 Wilson Blvd., Suite 302, Arlington, VA 22201, call 703-247-4212, or visit www.accsc.org. The Medical Assistant diploma program is accredited by the Accrediting Bureau of Health Education Schools (ABHES), 7777 Leesburg Pike, Suite 314 N, Falls Church, VA 22043, 703.917.9503. Authorized by the Nonpublic Postsecondary Educational Commission (NPEC), 2082 East Exchange Place, Suite 220, Tucker, GA 30084-5305, 770.414.3300, 770.414.3309 (fax). For additional Consumer Information regarding Norcross, click here.